A 63-year-old man was referred to the Massachusetts General Hospital Neuroendocrine & Pituitary Tumor Clinical Center for management of a pituitary macroadenoma. He experienced increasingly severe retro-orbital headaches in the past year. He reported no double vision, fatigue, orthostatic dizziness, change in beard growth or reduction in libido. An outside head CT scan showed an enlarged pituitary gland. A pituitary MRI with magnified pituitary slices and gadolinium contrast was ordered. A well-circumscribed “snowman-shaped” sellar mass was identified, measuring 2.6 cm x 2 cm x 1.8 cm (anteroposterior x transverse x craniocaudal) with suprasellar extension (Figure 1). The lesion was heterogeneous on T1-weighted scans after enhancement with IV gadolinium contrast. An area of hypointensity in the superior margin was consistent with a small area of cystic or hemorrhagic degeneration. Although the mass did not extend laterally into the cavernous sinus, the sellar mass extended upward into the suprasellar cistern through a hole in the dural, the diaphragma sellae, to compress the optic chiasm. The restriction of adenoma growth by the diaphragma sellae results in the snowman shape of the macroadenoma. The optic chiasm and infundibulum (pituitary stalk) could not be identified on coronal or sagittal images (Figure 1). Visual field on confrontation suggested lateral field deficits (bilateral lateral hemianopsia) that were confirmed on formal Goldmann kinetic perimetry visual fields. Figure 1. Preoperative MRI scan. A large “snowman-shaped” pituitary adenoma (green arrow) has heterogeneous enhancement after gadolinium contrast administration. A small hypodense area in the adenoma likely represented hemorrhage/cystic degeneration (yellow arrow). The tumor does not surround the carotid siphon, an S-shaped portion of the internal carotid artery (red arrows) within the cavernous sinus located laterally from the sella turcica where the pituitary gland resides. (A) Coronal image. (B) Sagittal image. Abbreviation: SS = spenoid sinus. Source: Stephanie L. Lee, MD, PhD, ECNU. Reprinted with permission. Initial hormonal evaluation was normal and included morning adrenocorticotropic hormone 18 pg/mL, cortisol 13.64 µg/dL, thyroid-stimulating hormone 2.14 uIU/mL, free thyroxine 1.2 ng/dL and prolactin 12.6 ng/mL. The patient’s morning testosterone level was normal at 324 ng/dL, with follicle-stimulating hormone 2.4 mIU/mL and luteinizing hormone 1.6 mIU/mL. His insulin-like growth factor I level was normal at 124 ng/mL. The patient was treated preoperatively with stress-dose hydrocortisone 50 mg. He then underwent transsphenoidal pituitary tumor resection. After the surgeon believed there was an adequate excision of the tumor, the extent of tumor resection was confirmed by an intraoperative MRI (Figure 2 on page 8). Figure 2. Intraoperative MRI scan. The large macroadenoma is not seen after transsphenoidal surgery. The optic chiasm (yellow arrow) can be seen after removal of the tumor. (A) Coronal image. (B) Sagittal image. Abbreviation: SS = spenoid sinus. The operation was concluded after the imaging confirmed the complete resection of the pituitary adenoma. The patient’s postoperative course was uneventful. Imaging 4 weeks after the resection confirmed complete resection of the suprasellar mass with residual enhancement of the resection bed and sphenoid sinuses (Figure 3 on page 8). The postoperative MRI revealed a normal optical chiasm and a downward tending of the infundibulum to the residual pituitary gland located inferiorly along the sella turcica (pituitary fossa) of the sphenoid bone. Pathology confirmed a pituitary adenoma. His anterior and posterior pituitary function were normal 6 weeks postoperatively, and his visual field deficit improved. Imaging like that used in this case occurs in a specially designed operating room that allows MRI scans during surgery without moving the patient from the surgical table. The MRI is kept in a shielded enclosure during the procedure and then moved along a track into the operating room for imaging. Clinical indications for the use of intraoperative MRI in neurosurgery include resection of pituitary macroadenomas. In the past, these tumors underwent transsphenoidal resection, and the postoperative MRI was performed after 1 or more days after the procedure to check for complete removal. If residual tumor was found, the patients underwent watchful waiting, external radiation or repeat surgery. The strategic advantage of an intraoperative MRI is that the imaging is performed during the operative procedure, and if there is any residual tumor, surgery can be resumed after the MRI is moved back into the shielded enclosure. Figure 3. Four-week postoperative MRI scan. The large macroadenoma is not seen after the transsphenoidal survey. The optic chiasm and infundibulum (pituitary stalk) can be seen after resection of the tumor. The pituitary stalk is deviated to the left of the sella where the residual normal thyroid is locate along the sella turcica. The floor of the sella enhances with gadolinium infusion after surgery due to postoperative inflammation. (A) Coronal image. (B) Sagittal image. Abbreviation: SS = spenoid sinus. It has been reported that the use of intraoperative MRI does not increase complication rates compared with conventional transsphenoidal surgery. Reports on the improvement of gross tumor resection using intraoperative MRI are variable, perhaps due to the expertise of the surgeon. Several reports suggest the use of intraoperative MRI allowed additional resection of noninvasive macroadenomas in 67% to 83% of the patients with a gross tumor resection. These results suggest that a substantial volume reduction and increased gross tumor resection of pituitary macroadenomas occurs with the use of intraoperative MRI compared with standard surgery. One study demonstrated that the gross tumor resection rates of invasive tumors was also improved with the use of intraoperative MRI compared with usual preoperative imaging and surgery (25% vs. 7%). 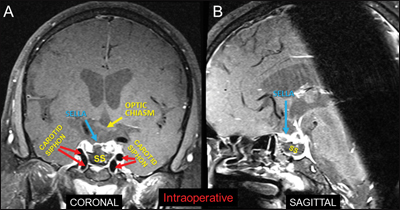 The use of intraoperative MRI, especially with transsphenoidal reoperations for invasive and noninvasive pituitary macroadenomas, leads to significantly higher “gross tumor resection” rates. This method prevents additional operations or treatment, such as radiation, because it reduces the number of patients with residual adenoma after surgery. This technology is usually found in specialized tertiary care hospitals but should be considered for reoperation for large pituitary macroadenomas or initial operation for large invasive pituitary macroadenomas. Boellis A, et al. J Magn Reson Imaging. 2014;doi:10.1002/jmri.24414. Fomekong E, et al. Clin Neurol Neurosurg. 2014;doi:10.1016/j.clineuro.2014.09.001. Tandon V, et al. J Clin Neurosci. 2017;doi:10.1016/j.jocn.2016.10.044. Stephanie L. Lee, MD, PhD, ECNU, is an Endocrine Today Editorial Board Member. She is associate professor of medicine and director of thyroid health in the Section of Endocrinology, Diabetes and Nutrition at Boston Medical Center. She can be reached at Boston Medical Center, 88 E. Newton St., Boston, MA 02118; email: stephanie.lee@bmc.org. Brooke Swearingen, MD, is associate professor of surgery (neurosurgery) at Harvard Medical School and co-director of the neurological ICU at Massachusetts General Hospital. He can be reached at bswearingen@partners.org. Disclosures: Lee and Swearingen report no relevant financial disclosures. Primary adrenal myelolipomas, relatively rare benign tumours of the adrenal cortex are typically unilateral, hormonally inactive and asymptomatic, hence often diagnosed as ‘adrenal incidentaloma’. Bilateral adrenal myelolipomas, in particular, may be associated with underlying endocrinopathies associated with elevated circulating adrenocorticotropic hormone (ACTH) concentration. Subclinical cortisol hypersecretion, irrespective of its ACTH dependency, does not manifest typical clinical phenotype of hypercortisolemia, and thus termed subclinical Cushing’s syndrome. In this article, hormonal evaluation in a middle-aged woman with diabetes, hypertension and incidentally discovered unilateral adrenal myelolipoma revealed underlying subclinical Cushing’s disease. Abdominal CT revealed another tiny focus in the contralateral adrenal gland, probably representing incipient myelolipoma.